There’s local and there’s hyper-local. The North Face’s “Backyard Project” hoodie lies firmly in the latter category. Made collaboratively with California artist Rebecca Burgess, whose Fibershed initiative stemmed from a desire to wear clothing produced within 150 miles of her front door, the topper is the first bioregional garment from a major apparel label. While The North Face didn’t quite meet Burgess’s bar, the firm came pretty close. Apart from the cotton, which had to be spun and knitted in the Carolinas due to the dearth of Northern Californian cotton mills, all of the hoodie’s components were grown and sewn within 150 miles of The North Face’s Alameda headquarters. The hoodie, which blends Foxfibre’s color-grown cotton and the Sustainable Cotton Project’s less-toxic “Cleaner Cotton,” is both a “garment and an opportunity,” according to Burgess. The North Face says it also worked to create as little waste as possible. The hoodie incorporates “zero waste” design characteristics such as spiraled cuffs and other pattern efficiencies. Plus, sewers used excess fabric to create pocket and reinforce the internal structure. The garment left its mark on the company in more ways than one. “The Backyard hoodie left our design team with a lasting inspiration that we are incorporating into other products,” Mott adds. There's local and there's hyper-local. The North Face's "Backyard Project" hoodie lies firmly in the latter category. Made collaboratively with California artist Rebecca Burgess, whose Fibershed initiative stemmed from a desire to wear clothing produced within 150 miles of her front door, the topper is the first bioregional garment from a major apparel label. While The North Face didn't quite meet Burgess's bar, the firm came pretty close. 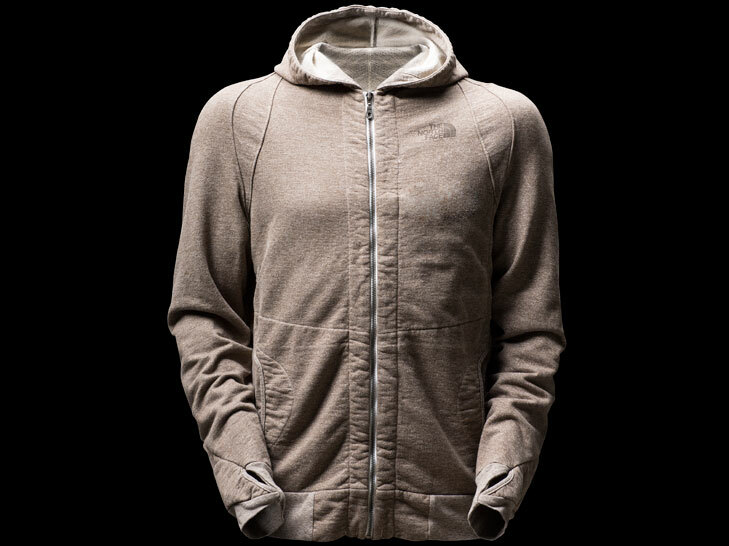 Apart from the cotton, which had to be spun and knitted in the Carolinas due to the dearth of Northern Californian cotton mills, all of the hoodie's components were grown and sewn within 150 miles of The North Face's Alameda headquarters.